If you have been waiting for the next iteration of the iPhone, mark your calender on September 12 and tune in to the online news. 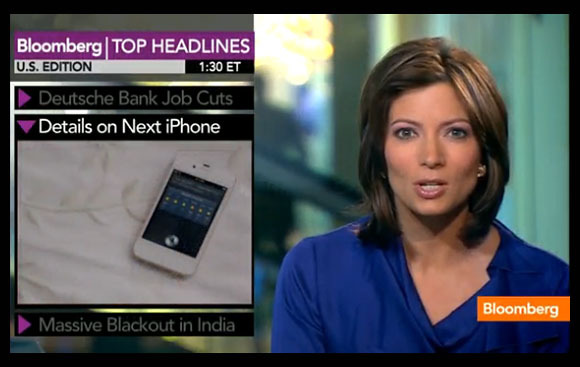 Image grab from Bloomberg Businessweek headlines video on July 31. Businessweek believes it has some details of the next iPhone. According to iMore, Apple is planning to debut the new iPhone (iPhone 5 or whatever they decide to call it later) on September 12, 2012, and to be followed by its release on September 21. This would mean that the current iPhone 4S would have been in the market for less than a year by the time the next generation is announced. My source for mostly accurate information of Apple products, The Loop gave its 'yep' to the piece of news. This information comes from sources who have proven accurate in the past. The website owner, Jim Dalrymple was at the event in California when the iPhone 4S was announced last year. Really, this is nothing like the details that people want to hear but at least it is something that is sure to be included in the new gadget. We have been hearing that the new iPhone is likely to spot a 4-inch display, with a 16:9 screen version, and that newer iOS devices will have smaller dock connector. Rumour has been circulating around for a while now that that SIM card would shrink further from the current 'micro' size. It seems that Apple is planning to squeeze quite a lot of things into the new gadget. But for the iDevice fans, they'd surely hope this iteration is not just to keep up with Samsung S3, but to set the bar higher. iPhone 4S is just about 11 months in the market and I am one of the earlier buyers of this version, so, I'm not really looking at upgrading to iPhone 5 just yet. But we'll see; hopefully Tim Cook and his team come up with some surprises up their sleeves. now a rm700 also can do all the job already.. still waiting for iphone5? @Meitzeu - words has it that the iPad Mini will also be announced that day. @jerryCarrie - it's good to have options, isn't it? @LifeRamblings - you mean your old phone, the S3 izzit?